Whenever a filmmaker of note premieres a new film, it’s a good time to revisit that director’s first film to gauge how far they’ve come as an artist. With Dunkirk hitting theaters next week, we look behind us at Christopher Nolan’s 1998 debut, Following. 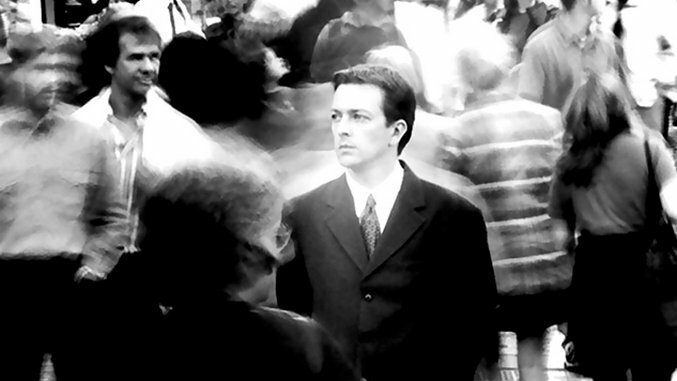 If the title of Christopher Nolan’s Following were a gerund, it would describe the actions of the film’s young male protagonist (Jeremy Theobald), who, as a means of ridding his life of boredom, aimlessness and likely some other, unspecified feeling of ennui, decides to tail random (and, eventually, not so random) strangers through the streets of London. If interpreted as a noun, however, the title could be presciently referencing the massive body of admirers Nolan will accrue in subsequent years thanks to the directorial trademarks first introduced in his debut. Most prominent among these include a brooding antihero driven to action by an idée fixe and, even more iconically, non-linear storytelling whose temporal fragmentation turns plot into a puzzle to be solved. In the end, the coming-together of this, Nolan’s first conundrum, satisfies but feels a tad shallow, not least because the non-linearity on display is pure surface, an exercise in audience manipulation that lacks any clear narrative or thematic justification. Whereas a film like (500) Days of Summer chops up linearity to evoke the erratic movement of memory, and Nolan’s own Memento (released in 2000, only two years after Following) explicitly orients its non-chronological structure vis-à-vis the amnesiac hero’s fractured sense of time, Following would have been more or less the same movie had its story been told straight. The only missing thing would’ve been the fleeting, primordial pleasure of seeing the narrative gaps, forcibly generated by Nolan’s slice-n-dice storytelling, filled in—of seeing the incomplete made whole. Still, the hop-scotch-like structure of Following’s story has significant resonance with the rest of Nolan’s work. In addition to being a lot of fun, it represents the beginnings of the director’s career-long experimentation with cinematic temporality, and, more specifically, with introducing a progressively wider gulf between the fabula (a term, originating in Russian formalism, that describes the chronological order of events within a story) and the syuzhet (how these events are presented to the viewer/reader). Through increasing the distance between a movie’s timeline and the viewer’s experience of it, Nolan has, over the years, expanded the possibilities of cinematic storytelling, an endeavor that began with his very first film. In Following, Nolan’s artful subversion of the linear norm is, as mentioned, only semi-successful, but it nonetheless makes the film feel uncommonly assured for a debut, an impression that extends to the movie’s groovy repurposing of past cinematic influences. Shot on black-and-white 16mm and starring non-professional actors, Following exhibits the visual sensibilities of the French New Wave, but its spirit straddles Hitchcock and classical film noir. The likes of Double Indemnity and Out of the Past are evoked in the heavy shadows, the femme fatale archetype and the fact that the bulk of the movie is told in flashback. The Master of Suspense, on the other hand, surfaces in numerous other details: the Rope-esque duo of the dandyist male criminal (Alex Haw) and his partner, the sudden bursts of psychopathic violence, the way in which the driving plot point of fetishistic burglary thematizes voyeurism in tandem with the seductive transgression of invaded privacy and crossed boundaries. Fully leaning into the confluence of noir’s stylistic trappings and the psychosexual bent of Hitchcockian cinema could have produced a twisty, twisted masterpiece. Alas, Nolan spends too much time on the intrigue of pure plot—dramatic incidents and reveals—and too little on the people driving the action. The wandering protagonist, especially, should have been explored more, given how fascinating his motivations are. Why does he follow people? Why does he take up breaking and entering as a pastime? Why, in an intriguing narrative turn, does he pretend that his own flat is someone else’s and then break into it with his burglar mentor Cobb (certainly the namesake for Leonardo DiCaprio’s mind-heist maestro from Inception)? Kudos to Nolan for inviting us to ask these questions at all and making an effort to answer them, but the effort could have been greater, the insights deeper and more rewarding. Still, when you’re caught in the throes of the movie’s slick, sordid momentum, complaint will likely be the furthest thing from your mind. Ever since helming The Dark Knight trilogy, Nolan’s name has come to be increasingly associated with blockbuster spectacle and a general obsession with size and grandeur (his recent propensity for shooting in IMAX—and now with Dunkirk, 70mm—fuels this mythos mightily). What must not be forgotten, however, is that this is the same guy who made tightly plotted, labyrinthine, puzzle-box pictures that, at their finest, also mined rich thematic depths, ranging from the toxicity of rivalry (The Prestige) to the existential crisis of a man psychologically suspended in time (Memento). This other Nolan—the original Nolan, really—had his start with a sparse, stylish little movie meticulously constructed around the director’s cinephilia and his sense of narrative play. Though the Nolan of titanic epics has his merits, we would do well to remember his more impish side as well. Jonah Jeng is a writer and film studies graduate student whose work has been featured in The Film Stage, Taste of Cinema and Film Matters. For him, joy is found in the company of loved ones, the enchantment of cinema and the wholesale consumption of avocado egg rolls.